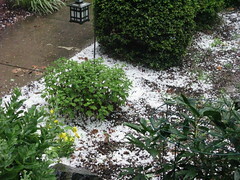 June 19, 2008 by Alphageek in "alphageek bourbon ice hail thunderstorm"
This is a quick hitting post. Some free ice for my bourbon fell out of the sky. I have posted this picture so that you can see what happened. If you click on the picture, you can go to my flickr account where you can see a short video clip. "alphageek bourbon ice hail thunderstorm"